Four candidates are coming to audition for the journalism line the Administration approved after Colleague Peter Parisi resigned. Should they be told the truth about the internecine civil war? Next week on Tuesday April 1, and Thursday April 3 and the following week on Monday April 7th and Thursday April 10th the Personnel and Budget Committee will be interviewing candidates for a tenure track journalism position You are invited to attend the breakfast with the candidate (if it’s scheduled), the luncheon (students are invited) and the classroom presentation. Listed below are the dates of their visit, the names of each candidate, and current university affiliations. Please rsvp with Carol and Tina if you plan to attend any of the scheduled events. PSC Chapter Chair trying to intimidate a Colleague at D:F/M faculty meeting. Bullying is a cherished tradition in D:F/M. 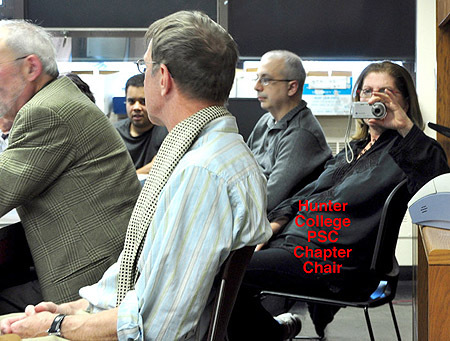 1) It’s absolutely silly that I can’t mention the name of a prominent public figure, the Hunter College PSC Chapter Chair, conducting a very public jihad, apparently using whatever means she believes is at her disposal, including Hunter-L (such as linking to the Chronicle of Higher Ed). See this other link to a WORD news story for context, reference: http://hunterword.com/articles/1572 (Postmortem: The Children’s Learning Center Debacle). 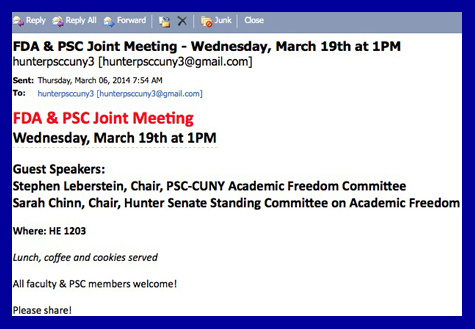 Regarding this PSC Chapter Chair vs. Hunter College President, or PSC Chapter Chair Barbara Bowen Proxy vs. Hunter College President, it should be obvious that this is more than a domestic D:F/M matter AKA “department politics,” which supposedly can’t be recognized, addressed nor criticized on this listserv even though the rancor has moved beyond department and campus boundaries. It’s approaching critical mass. 2) As for “department politics:” In a meeting a while back with the Provost, I was told that the administration was concerned about the image of the department. At one point in that long meeting, I was told to contact the Acting Dean of Diversity and Compliance, and together he and I were to contact the CUNY Dispute Resolution Center (http://johnjayresearch.org/cdrc/). Note: There are Colleagues who have said at department meetings that there is no rancor and no concern on the part of the Administration. The rest is in the attachment. 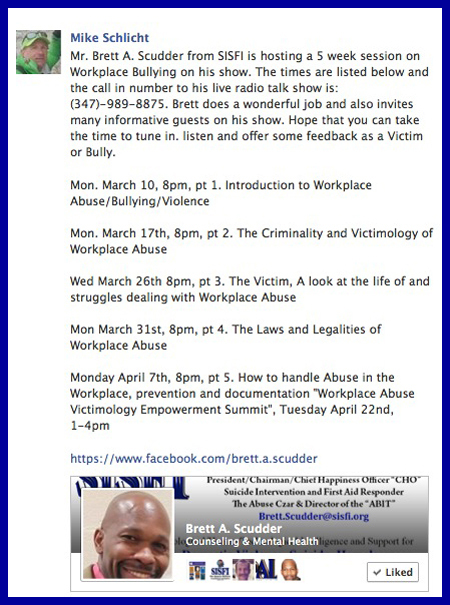 Workplace Bully Radio Show, Monday March 10, 8 p.m.
Brett A. Scudder is so good and savvy and has helped so many people … that I sometimes like to imagine that he could walk on water if he wasn’t so busy helping others. 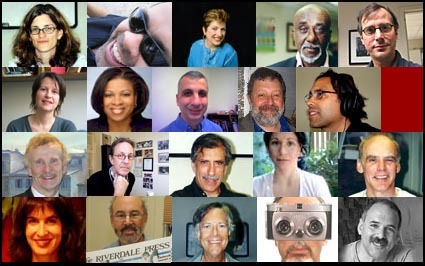 You are currently browsing the The WORD Blog blog archives for March, 2014.